If you're a gardening enthusiast with a keen interest in irises or other perennials, you've probably come across the term tetraploid. There are tetraploid daylilies, for example, and in the iris world you'll see the term used to describe some miniature tall bearded (MTB), Siberian, and other types of iris. But what is a tetraploid and why does it matter if a variety is tetraploid or not? Plants and animals are made up of cells, and in the nucleus of each cell are structures called chromosomes that carry the organism's genes. These chromosomes come in sets. For almost all animals and many plants, there are two sets of chromosomes in each cell. Humans, for example, have two sets of chromosomes, 23 in each set. At conception, each person receives one set of chromosomes from their mother and one from their father. One can't really think of any simpler way for an organism to inherit genes from both parents. The tetraploids were so popular with iris breeders that by the middle of the twentieth century, virtually all new TB varieties were tetraploid. This is still the case today. One must be cautious, however, in associating tetraploids with large size. Size is determined by many factors. One of the very smallest bearded irises, the dwarf species Iris pumila, is a tetraploid although the blooms are only a few inches above the ground! The great importance of tetraploidy in plant breeding is not that tetraploids are sometimes larger, but rather that more genetic combinations are possible with tetraploids than with diploids. With four copies of every gene instead of two, there are just many more possibilities! One extraordinary aspect of tetraploid breeding is that hybrids between different species or types may be fertile if the parents are tetraploid, but sterile if the parents are diploids. The standard dwarf bearded irises (SDBs), for example, are fertile hybrids between tetraploid TBs and the tetraploid dwarf Iris pumila. So tetraploidy makes possible whole new types of fertile hybrids that simply could not exist otherwise. This is the main reason some hybridizers have taken such an interest in tetraploids. So now we come to the topic of this post: tetraploid arils. 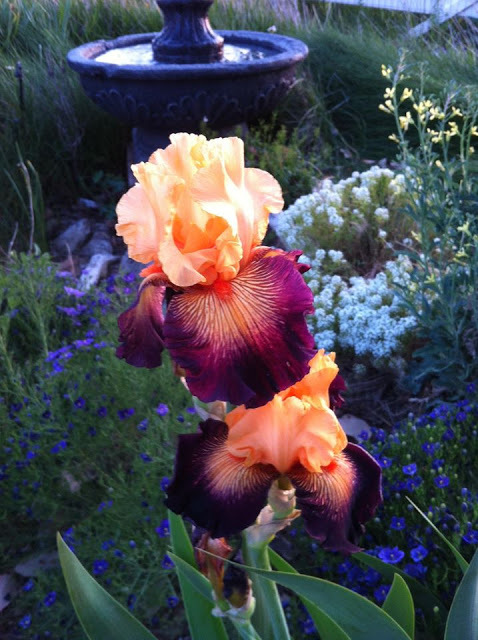 I love aril irises, with their exotic color patterns and dramatically shaped blooms. Most aril species are diploids. (I'm referring to pure arils here, not the arilbreds, which are a mix of aril and bearded ancestry.) In fact, the oncocyclus arils (the type that usually comes to mind when one thinks of arils) are all diploid. 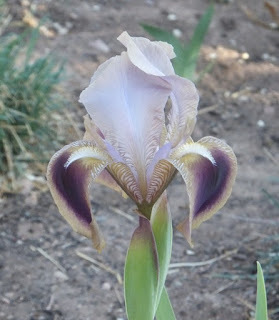 Crossing them with bearded irises, when it can be done at all, produces sterile hybrids. Think of the possibilities that could open up if there were a family of tetraploid arils, like the family of tetraploid TBs! Aril hybridizers have been thinking of that possibility for decades, and there are in fact some tetraploid arils, just not very many yet. First, although all the oncocyclus species are diploids, there are two Regelia species that are natural tetraploids: Iris hoogiana and Iris stolonifera. A classic hybrid from these two species, 'Bronze Beauty Van Tubergen' (Van Tubergen, R. 2001) is also tetraploid. 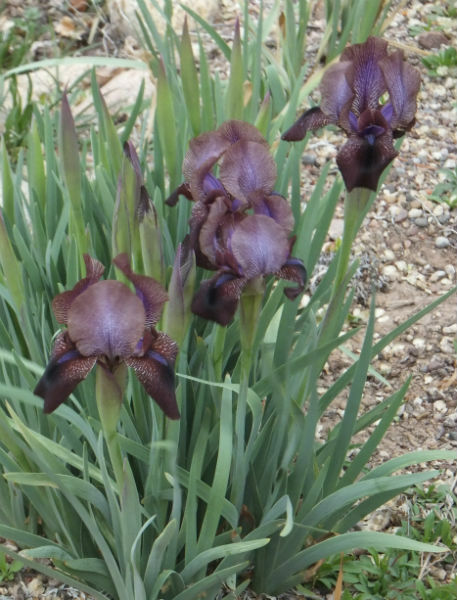 These are all lovely irises, but being Regelias, they do not have the oncocyclus characteristics, like huge globular blooms and big velvety black signals, that are the allure of aril irises for most people. Second, a few arils with some oncocyclus ancestry are "accidental" tetraploids. Occasionally, a diploid parent produces a tetraploid seedling by chance. 'Persian Pansy' (Austin, 1960) and 'Tel Hashi' (Kellie, 1968) came about this way, but both seem to be lost now. 'Dunshanbe' (Wilkes, 1977), a seedling of 'Persian Pansy', is still being grown however, and is quite lovely with a dark sheen and nice veining. Its makeup is still more Regelia than oncocyclus, however. Third, some breeders have created tetraploids deliberately using the chemical colchicine, that interferes with cell division, sometimes converting a diploid plant to a tetraploid. Usually, the plants created this way are unstable and sometimes unhealthy, but they can be crossed with other tetraploids to produce stable, reliable plants. 'Werckmeister's Beauty' (Werckmeister, 1992) came from this approach. In the 1980s, Sam Norris and John Holden created many tetraploid arils of predominantly oncocyclus makeup using this method. Alas, few have survived to the present day, and none are available commercially. Lawrence Ransom used one of these to produce 'Tadzhiki Eclipse' (Ransom, 1997) and 'Tadzhiki Bandit' (Ransom, 1997), both of which are still being grown in Europe and the US. 'Tadzhiki Eclipse' is, I think, the most oncocyclus-like tetraploid aril one is likely to be able to acquire today. Through a little patience and diligence, I have acquired a small collection of tetraploid arils from the plant sale of the Aril Society International, occasional offerings of commercial growers, and the generosity of fellow aril hobbyists. I encourage others to do the same, especially those who live in the western US or other regions where pure arils can be grown without heroic measures being taken on their behalf. These are arils, not arilbreds, so they may need a little special attention regarding soil and siting. I have found them easier than most other pure arils, however. 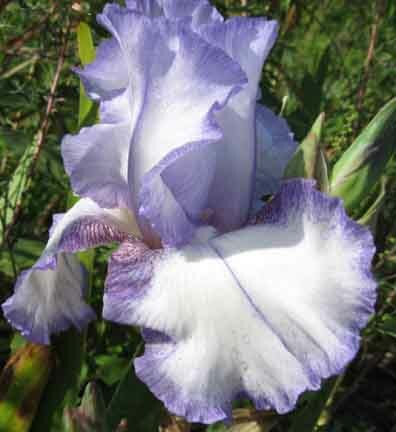 If you are a hybridizer, you can cross them with each other to expand the family, or cross them with tetraploid bearded irises to create brand new types of fertile arilbreds. Even if you are not a hybridizer, you can enjoy their bloom and know that you are helping preserve a very important group of plants, which may someday become the progenitors of new breeds of irises we can only imagine today. If you can grow aril irises, have you tried any of the tetraploids? I think they are worth seeking out. 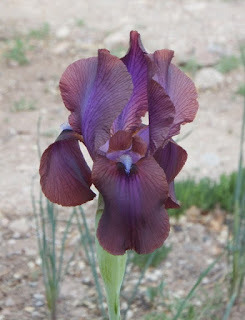 "Talking Irises" TALL BEARDED IRISES--GARDENING IS NO RESPECTER OF AGE: "Garden Inspiration for the Young Gardener in Your Life"
One of my first recollections as a child was my grandmother's flower garden. I still remember the array of colors, the intoxicating fragrance and its sheer beauty. I credit her for planting the seed resulting in my passion for flowers and gardening. picture of it today with a modern digital camera. It was beautiful! It's no coincidence she had a mother and grandmother who shared their love of gardening with her. It is easy to stimulate a child's interest when they see you having fun and enthusiastically immersing yourself in an activity you are passionate about. Later, my parents continued that legacy--one that I hope I have passed on to my children and grandchildren. 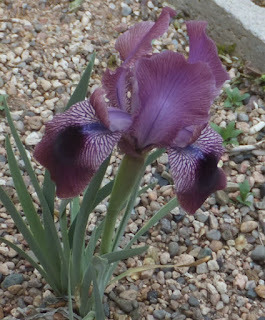 Tall bearded irises were among my family's favorite flowers. I think my story is not unlike many: parents and grandparents helping to cultivate the love of plants of all kinds. Gardening is an activity that is no respecter of age--the very young to the very old can participate. My granddaughters Eliza and Paige in the garden picking flowers to make arrangements. Eliza has an interest in irises. She helps water, weed and deadhead the blooms. This year she's going to start planting. The American Iris Society (AIS) has a youth program. It encourages interest in irises, with emphasis on growing, and possibly hybridizing irises for our young gardeners. For more information on this program, go to AIS Youth Program. In summary, encouraging children and youth to play an active role in gardening, specifically irises--by planning an iris bed, choosing the rhizomes, planting, caring for, harvesting the flowers, and arranging the blooms or even hybridizing them--makes for an enjoyable and productive hobby. As adults, we can plant a seed that can enhance their lives on many levels. If you have experience involving or encouraging youth to garden, I'd love to hear what you've done! The annual Society for Louisiana Irises (SLI) convention will be held in Shreveport/Bossier City, Louisiana, from Wednesday, April 20th through Sunday, April 24th, 2016. Make your reservations now! The event will be at the Hilton Garden Inn at 2015 Old Minden Road, Bossier City, LA 71111. Reservations can be made by calling (318) 759-1950. You can also access their website at Hilton Garden Inn Bossier City, and be sure to use promotion code "SLI". Attendees will have time to visit many beautiful sites in the Bossier City area. If you are interested, the SLI board meeting will take place on Wednesday from 6 PM to 9 PM in the hospitality suite. The garden tours will be on Thursday. The first stop will be the Newton/Taylor garden located outside of Mooringsport, LA. Mooringsport is about 15 miles north of Shreveport, which in the NW corner of the state of Louisiana. The Newton/Taylor property was a family "camp" for many years before Ray Taylor and Eric Newton moved there in 1996. Ray is a horticulturist and Eric is a landscape architect, so this is a gorgeous gem of a garden. An acre of gardens includes collections of Japanese Maples, Camellia japonica, sassanquas, many varieties of roses, spring flowering shrubs and perennials including Louisiana irises. You will also see many unusual trees, including palms. 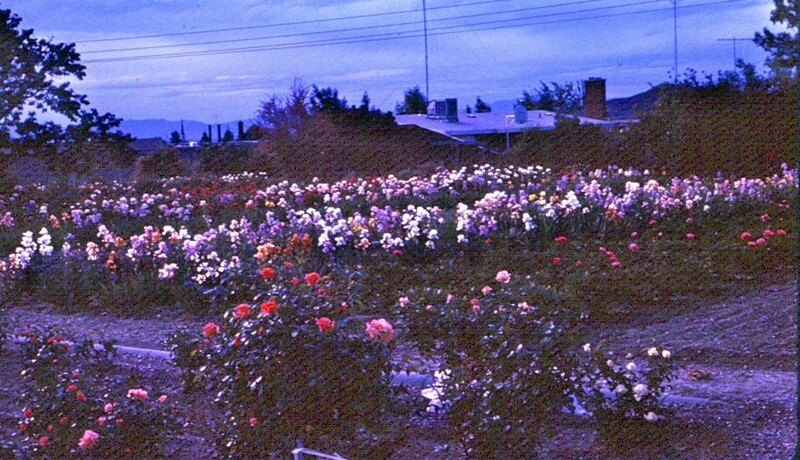 Vast bulb plantings that predate Ray and Eric's tenure bloom profusely in the spring. The bus will then travel a few miles down the road to Plantation Point Nursery located on historic Caddo Lake. This is an opportunity to see and photograph about 80,000 Louisiana irises grown in just about every conceivable method. This is also the location of guest irises and seedlings from various hybridzers. Bobbie and Stan have built a double gallery old plantation style home facing the lake. There are several ponds with irises growing around the edges. Louisiana irises can be found in dug beds, raised beds, among the other landscape plants, in marshes and on the edge of Caddo Lake. Tours will be conducted of Plantation Gourmet Coffee, located on the grounds, and guests will be able to watch coffee being roasted and sample the results. Visitors will also be able to view recent additions such as Stan's Zen Garden, the Moss Steps waterfall, Bobbie's bog garden and Stan's tissue culture lab in "The Gator". "Hardy" gladiolas and large poppies grow well with Louisiana irises! Caddo Lake is natural, and many bald cypress trees grow in the lake. It covers acres from NW Louisiana into NE Texas. Louisiana irises growing on the edge of historic Caddo Lake with bald cypress trees in the background. Louisiana irises abound at Plantation Point Nursery. Thousands of Louisiana irises near the Crawfish Pond at Plantation Point Nursery with Caddo Lake in the background. Massive planting of Louisiana irises with bald cypress tress and Caddo Lake in the background. Hundreds of blooms greet visitors to Plantation Point Nursery in Mooringsport, LA. 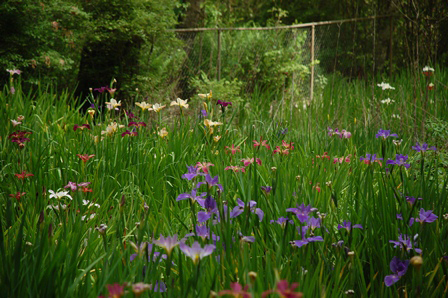 Visitors will also find hundreds of Louisiana irises separated by color. Lunch will be served on the patio of the "Big House". Visitors will be treated to an authentic "Cajun" catered lunch and entertained by a Cajun music band. On Friday, April 22nd, the bus will depart from the hotel for the R.W. Norton Art Gallery and Gardens in Shreveport, LA. Established in 1947 by the R. W. Norton Foundation, the gallery and gardens are on 47 acres in south Shreveport. Visitors will see flowing streams, an extensive xeriscaped experimental garden, a large ginger collection, a collection of camellias and over 60 varieties of maple trees. Of course there is a large planting of Louisiana irises in one of the gardens. R.W. Norton Art Gallery and Gardens offers plenty of "water features". Of course you will find plenty of art and sculptures at the gallery. Visitors will see many different types of flowers, trees and plantings. Convention guests will then load up on the bus for a two hour trip through the farms and forest of central Louisiana as we head for our destination of The Caroline Dormon Nature Preserve near Saline, LA. Briarwood, as it is mostly known by locals, is the birthplace and home of Caroline Dormon, a world renowned naturalist, author, artist and the first woman to be hired by the US Forestry Service. Enjoy the view at the big pond at Briarwood. Visiting the home of Caroline Dormon is like traveling back in time. The Briarwood Nature Preserve has certainly accomplished its mission of keeping the preserve the way it was when she lived in this tranquil place. 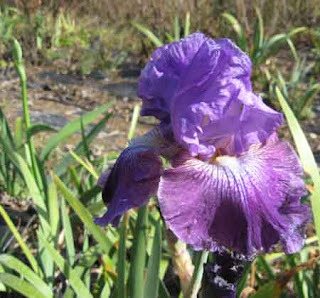 Dr. Dormon collected many Louisiana irises from the wild in south Louisiana and moved them to her gardens at Briarwood. One really wet spot called the "bog garden" contains many of the original plantings by Dr. Dormon. Briarwood, as a nature preserve, has many places for water fowl. The "Reidhimer Pond" has recently undergone much work and is the home for wood ducks and other wildlife. Mountain Laurel in many colors can be found along with hundreds of native azaleas. Convention guests will be treated to state-wide famous BBQ in the guest center. Many trails are available for walking and "people movers" are ready to transport those who are unable to walk the trails. Wildflowers abound in their natural settings. Louisiana irises growing in the bog garden at Caroline Dormon Nature Preserve. The second "log cabin" built by Caroline Dormon at Briarwood houses many of her various collections. There will be an American Iris Society approved iris show at the hotel on Saturday, April 23rd, consisting of beautiful Louisiana irises. The schedule of events and a registration form can be downloaded from the website of the Society for Louisiana Irises. Make your reservations now to attend this wonderful convention and have a chance to visit the Shreveport area as well as Bossier City and the surrounding area, known as "Louisiana's Other Side". In the world of iris hybridizers we often hear "you can't do that!" Gather information, learn all you can about the possible results, and forge ahead. Even though some say "it can't be done," don't let them deter you from following your iris dreams. Two beautiful parents may not produce exactly what you visualized, but you will make progress, and most important, you will learn. One of the most important things you will learn is the type of children your parents will produce. Whatever your goal may be, stay focused, stay aware of other advancements, and keep making those crosses. You can't plant them if you don't cross them! Over the past 10 years 'Over and Over' is the strongest rebloomer here in my zone 6 garden. I've asked several people if they were working with it. 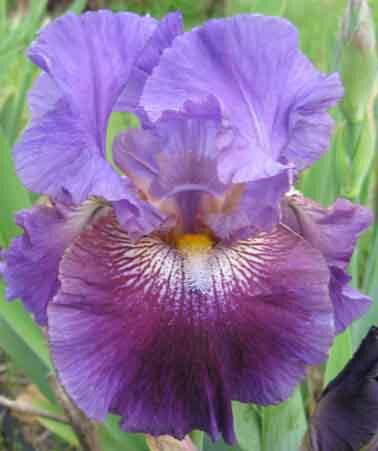 Most replied that the iris was too plain or old looking. I thought I'd encourage some, maybe, by showing some of the children I'm getting by using 'Over and Over' as the pollen parent. The pod parent of 2130-01Re is a seedling from 'Again and Again' X 'Echo Location.' 'Again and Again,' and has some plicata in the parentage, while 'Echo Location' is from two plicatas. I did expect plicata seedlings, and there were three. Two rebloomed, but didn't add anything new to the vast group of purple plicata rebloomers or my knowledge of their genetic makeup. There were several interesting things in pale yellow with lavender splashes and streaks. The seedling above (01Re) was saved because the maiden bloom was a deep plum colored self. The next year it bloomed in August, but the color was more pale. The following year it settled into the above pattern and color. This seedling, 2612-01Re, has a bit more modern look than 'Over and Over.' Since this was maiden bloom, it will be years before the final determinations are made. By then I plan, and hope, to have many more seedlings blooming from this cross and others like it. On first glance it appears the seedling has better form than either parent. Not all will be good enough for the world to see, but things are definitely looking up. This is not enough to make any big declarations, but I suspect there will be more to come. I'd like to branch out into other colors, as this is not my favorite. Stay tuned. Next, I'll try "Over and Over" as the pod parent. If you have questions or comments, please add them below. My blog updates and my actual gardening progress are a bit out of step, so this post is about the fun we had planting our first set of rhizomes way back in October. I encourage you to read it, even though, since this part of the process was both fun to do and funny to read about. So, now it’s 9:30 at night, I’m eating from-the-freezer stir-fry, and having just unloaded and re-loaded the dishwasher, I can now sit down and gush and crow and preen over my garden photos (none of which show the true measure of the accomplishment I feel!). I’m that delightful combination of excited and bushed, which is a nice way to wrap up the weekend. And I get to share my progress photos with you, which makes it much more fun. But first, of course, I have to tell you what got done! From previous posts, know you that I’d cleared an area of the yard with a gentle slope for our great planting endeavor. I also procured (donated!) kiddie pools, tires, and pallets. Drip irrigation materials are on hand, and the rhizomes have all arrived (bought online, and from the San Fernando Valley Iris Society, who are just the loveliest people around). Six yards of very nice loamy, amended soil was delivered. So, no more obstacles, right? P.S. Whomever came up with the expression “dirt cheap” has never had a dump-truck load of it delivered to their house. But, that was premature. Because, you know, I’m not just going to stick them in the beds willy-nilly. There has to be a plan! A grand scheme! An over-arching concept! Right? I mean, I’m starting from bare dirt in about an acre of land. This is my big chance to design something amazing, and brilliant. Something that will end up in high-end gardening magazines, and be the first result when you search “gorgeous iris garden” and also be the ideal for all future iris lovers across the globe. I can’t just stick them in a kiddie pool and call it genius! There must be A Plan! This, friends, is where the magic of gardening begins to ebb away, and the practical realities of being a Type-A overachiever with tendencies towards the grandiose starts to inhibit the actual gardening part of having a garden. I kid you not, there are probably a dozen steps between the dirt arriving, and the first iris rhizome getting planted in that dirt. I’ve had a few sips of wine, so it’s starting to be amusing to me...feel free to laugh along with me. Any tags that come with the rhizome go into the envelope. I feel so clever. Of course, my goals for the garden are different from most commercial growers’ goals and requirements. I could have just planted them alphabetically! Or by type (“Tall beardeds on the left, folks, and intermediates on the right...”), but I created a slightly more challenging rubric of by-season and by complimentary-color combination. Which is to say, all the early bloomers are together, and then arranged in color combinations that enhance and support the beauty and uniqueness of each variety. Then the mid-season bloomers are together, and the late bloomers are together, etc, all arranged by a totally subjective and probably not-entirely-perfect color-enhancement and combination that, now that I’m typing it, sounds almost silly. But, truly, a lot of thought went into which iris should be planted near which other iris. In my personal yard, I have what I call my yellow garden. I have combined many of my favorite yellow and yellow-ish plants in one area, and they all bloom their own variety of yellows, creating a really lovely and inviting spectacle. But I noticed when iris-shopping that often all the white iris (for example) look indistinguishable when they are planted together. There are subtle differences, of course, but the eye wearies of all white, or all blue, or all deep purple. And creating contrasts, and appealing color combinations really boosts the value of some of the more average or mundane blooms. A yellow bloom loses it’s zing next to a similar yellow bloom. But either of them in contrast with a vibrant purple (or reds, or pinks) become a vital part of a visually exciting tableau. Yeah, I just said that! So, I printed out all the named iris stats onto envelopes, in full color. Then I separated them into bloom season (early, mid, late). And then began the fun of deciding which combinations of rhizomes should be created, and into which kind of bed (tires, raised beds, or kiddie pools) they should be planted. Now, I am going to toot my own horn again, and say that normally I am very very good at estimating how much time a task will take. And normally, I will brag about how that is one of my superpowers. Because of that, I will happily confess that I grossly, massively, and completely underestimated how long it would take me to create the layouts for the beds. I figured it would take about an hour. It took closer to four. That was with Chris’ help. And that was after I had printed the envelopes, broken them into bloom-season groups, and made a preliminary layout. I was utterly unable to make the process faster, and I suddenly understood the appeal of planting them in alphabetical order. When I woke up that morning at seven, I thought I would have everything planted by noon. Looking back, that is so naively adorable! I wrapped at sundown, because I still needed hardware and knew I wouldn’t get back before dark. Also, the dogs called and were threatening to see what they could whip up from leftovers and whatever was in the freezer... I had to call it a day. All the mid-season bloomers are planted in the raised beds, and the late-bloomers are the next to go in. The great news is that I think we have a very attractive layout for each bed, and we will be able use all three types of beds for this test planting. I painted the tires for the early bloomers (because black tires in our climate will simply bake the roots of any rhizomes), so they finally got planted, too. Then I finished the drip system installation, and then... well, if you garden, you know there will always be something else. It will probably be weeding. I’m convinced the runoff will create beautiful green stripes of weeds in downhill rivulets from our beds... and then the gophers will really have something to think about! It started out hot, so we set up in the shade. You can see our magical raw materials: tires, raised beds, and lots of rhizomes. A thousand thanks to Chris for her help and delightful company. You don’t have to guess that it’s genius at work when you see we’re using the hood of the car to lay out our magic envelopes and create the masterful final designs (cough, cough). I was pretty convinced we were going to need dozens of beds and walkways for the all the iris I ordered... and ha-ha, uh, no. This is pretty much the final configuration: early bloomers in the tires, midseason bloomers in the raised beds, and late bloomers in the kiddie pools. This all the room it takes to plant approximately 140 rhizomes. Yeah, I was surprised, too! This was the trial layout before the tires were painted. The final layout is pretty much just like this preliminary version. This is where the magic happened that first day. We laid out weed-blocking fabric, and then on top of that, we rolled out fine-grade wire mesh, to discourage the below-ground critters from coming up into the beds from underneath. I use the word “discourage” realizing they may come through anyhow, but at least we made it challenging! You, too, can work for nine hours and have this to show for it! But, finally, rhizomes in the soil. Once the layout was in the database, we removed all the lovely tags, so the plants can just look natural. And relaxed. Like me. There has been so much progress since these shots, so keep your eyes peeled for the next update. I can’t wait to share it all with you! And I keep my promises: here is a lovely photo of Doctor Who, a dynamite performer that I just love. 'Doctor Who' (George Sutton, R. 2009). Seedling U-740. TB, 37" (94 cm), Midseason to late bloom. Standards and style arms chinese yellow (RHS 20D); Falls beetroot purple (71A), chinese yellow and beetroot burst pattern; beards spanish orange; ruffled; slight sweet fragrance. 'Tropical Delight' X 'Snowed In'. Sutton 2010. Honorable Mention 2012.